2. A plastic recycling point to be provided. 3. A scheme for CCTV surveillance of the site and public road adjacent to the site must be submitted to and approved by the Council. The approved scheme must be implemented before the store opens. Following the planning approval for the Aldi store on Crow Lane, have committed to providing a total of £12,000 towards a 3-year scheme to fund a 3 year lease of a 12-seat mini bus. The bus will have ramp access and serve the areas of Henbury and Brentry over 3 - 4 mornings each week. The service will be operated by Lawrence Weston Community Transport from the date the store is open. It is envisaged that the route will include all existing retail areas in Brentry and Henbury including, of course, the Aldi store. The next step is a survey to confirm the likely number of users and optimum route. If you have suggestions about the route and take up please go to the Community Council Board, http://henburybrentrycommunity.org.uk/, and leave a comment under the Community Transport category. A city wide consultation on how the existing green spaces should be improved and maintained is being carried out in order to produce an overall Plan which will itself be the subject of wide public consultation and meetings later in 2009. The aim of the Plan is to deliver the standards and policies set out in the council’s Parks and Green Space Strategy, while ensuring that the significant investment anticipated for local green spaces is directed with the help of local stakeholders and communities. A number of members of the Community Council are taking part in this initial consultation together with people from Southmead under our Neighbourhood Partnership banner. The Henbury and Southmead Area Green Space Plan will set the foundations for green space provision for the next 20 years and decide where different types of facilities and space - such as children’s playgrounds, sports pitches, young people’s facilities, dog-free areas, toilets and park keepers - are to be located. It will also identify if any green space is no longer needed and can be used to fund improvements to other spaces. On a citywide basis 40% approx of the funding will come from the sale of existing unused green space. If you have any comments please go to the Community Council Board, http://henburybrentrycommunity.org.uk/, and leave a comment under the Green spaces category. Pupils from Henbury School have taken part in the Pilot Project for the Community Transformers Fund. The fund is a new scheme set up by The Safer Bristol Partnership and the Police Community Trust. Under the scheme young people can put forward bids for projects they have devised to benefit the community through their school or youth worker. There will be a special Oscar style award ceremony in October, with special awards for the most successful ideas and the young people who have contributed the most. In Henbury pupils from the school identified a problem with graffiti in the entrance hall of the Laundry room at Henbury Court Flats. 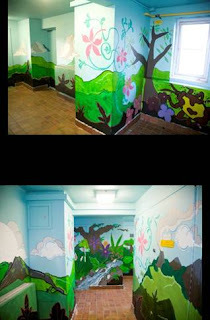 As part of their artwork in school the pupils designed murals to go on the walls. The residents were asked for their opinions on which designs they liked the most. They prepared the walls ready for the new murals, then worked under the supervision of an Urban Artist to paint the chosen designs onto the walls. The room has now been transformed, and the pupils have received very positive feedback about their mural. A big thank you to all the young people and staff from Henbury School for all their hard work and making this pilot project so successful. 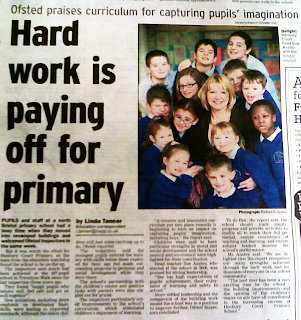 Henbury Court Primary School is on the up! 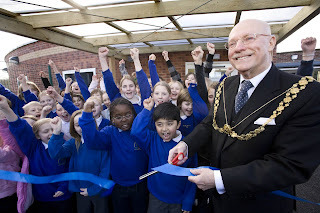 "As Chair of Governors I would like to say that I am proud to be associated with Henbury Court Primary School and am delighted at the new building. I would like to pay tribute to everyone who works in the school for the way that they gave up much of their own time to deal with the various moves that had to take place and to ensure that, despite the building chaos over most of the year, the school managed to run smoothly. The whole school was in attendance at the Grand Opening and they sang 'Don't build your house on sand' brilliantly, complete with actions. I often walk around the school and am impressed by the friendliness and confidence of the children: although academic results are clearly important and are always stressed, it is equally important for children to feel happy in school and to enjoy learning. I was recently in school during their 'creative curriculum' week when each class chose an 'Imaginary world' theme, such as aliens, underground and stick world. They decorated their classrooms appropriately and the curriculum for that week was largely based on that theme. It is events like this that make learning both fun and memorable. The school is a lively place to be in and there is always some even t about to happen - this term there is a Dance Festival when the whole school will take part, an Easter Bonnet Parade and an Egg Decorating Competitition. What's on at Henbury Library? Come along, we suspect you might like it!! You can borrow up to 20 items at once with your library card. It's free to use the computers in the library. The Centre has now been open for five months. Many local families are enjoying using the Centre both for Day Care and for Community Groups. After Easter we shall be starting two new groups on Mondays. In the morning Active Tots and in the afternoon Bumps and Babes for pregnant Mums. Our other Community Groups meet through the week in term-time as shown in our programme on page7. Drop-In and Baby Clinic on Fridays continue throughout the school holidays. Do please call into the Centre for details of our services or give us a ring on 0117 3534479. 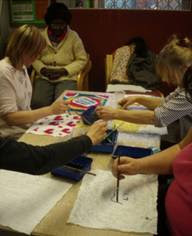 The Freedom Programme is run from several venues across Bristol. All courses are open to women from any area. For more information on the Freedom Programme contact Bristol Domestic Abuse Forum Co-ordinator on 0117 9142232 or http://www.freedomprogramme.co.uk/. Avonmouth Neighbourhood Policing Team are working in partnership with Bristol City Council and the community of Henbury and Brentry to reduce the number of cyclists riding on footpaths and pavements in your area. From a recent PACT (Partners and Communities Together) meeting the number of cyclists riding on the pavements and footpaths is a great concern to community members and as a result has now become a PACT priority for us to look at and if necessary enforce the laws that cover all aspects of cycling. • Is the cyclist headed for the same area of pavement as me? • Has the cyclist seen me? • Will the cyclist slow down, as they get closer? • Will the cyclist be skilled enough to avoid me if they don’t slow down? Cycling on the pavement can be even more threatening to people with poor balance. Many of these people are older or disabled and have a constant fear of falling. Cycling on the pavement simply adds to this fear. You are breaking the law when you cycle on the pavement. If you are found to be cycling on the pavement, you could have to pay an on the spot fine or be prosecuted. It is important that cyclists are familiar with the parts of the traffic law that apply to them. Cyclists are not permitted to ride on pavements (unless specifically signed as shared use), through subways or over pedestrian crossings. Cyclists must obey traffic signals, signs and one-way orders. At night, cyclists must show a white light to the front and a red light and red reflector to the rear of the bicycle. The Road Vehicle Lighting Regulations require bicycles to be fitted with lights and reflectors which are clean and working, when being ridden on public roads between sunset and sunrise and at other times in conditions of severely reduced visibility. A white front and a red rear light are required by the legislation, as are one red rear reflector and four amber pedal reflectors (for bicycles manufactured since October 1985). Since October 2005, it has been legally permitted to ride a bicycle with a flashing light. This is aimed at the cyclists who are cycling on the pavement that are causing a danger to pedestrians in the manner in which they are cycling. Discretion will be used in the prosecution of offenders. Use front and rear lights at night : The law! Have red rear reflector : The law! Obey traffic signals : The law! Be considerate : The law! Do not hold on to other moving vehicles : The law! Do not ride dangerously, carelessly or inconsiderately : The law! Do not ride whilst under the influence of drink or drugs : The law! Do not ride on the pavement : The law! Do not pass red traffic lights : The law! Only cross a solid white line in the middle of the road if vehicle being overtaken is moving less than 10mph : The law! Cross cycle-only crossings only on a green light : The law! Park your bike safely and considerately. Make use of cycle parking stands where these are provided. Park your bike where it will not be a hazard, obstruction or inconvenience to other pedestrians - particularly the visually impaired and other disabled people. Allow space for prams and wheelchairs, other cyclists or occupants leaving motor vehicles. Never park in front of a fire exit. Use a proper bike rack/ground anchor or robust street furniture -for example lamp-posts or railings (but observe requests not to use certain items of street furniture and be sure not to cause any damage). Remember that thieves can remove drainpipes and lift bikes off signposts. Lock your bike through the frame and secure removable parts. Lock both wheels and the frame together. Take with you smaller parts and accessories that can be removed without tools, for example lights, pumps, computers, panniers and quick-release saddles, or fit security fasteners on items such as wheels, headsets and seat posts. Compiled by PCSO 9551 Elliott-Taylor, any queries please don’t hesitate to contact me via 0845 456 7000. The New Year has started with a burst of energy at Willow Tree Surgery, Trevelyan Walk. Responding to comments by patients about the difficulty of getting appointments, staff have developed a new system which allows patients to speak to a doctor on the telephone to plan their care. Advice can be given, tests arranged and patients who need a longer appointment, or one at a particular time of day, can be accommodated. Feedback from the early days of the “GP triage” system, which is on trial, has been good from all sides. Patients are usually seen the same day and appointments are more efficient- for example, x ray and test results are available. Staff also feel less stressed. The system works best if patients can ring in first thing in the morning - the telephone number is the same 0117 9507750. The doctor will usually ring back within an hour. Another innovation is the setting up of the Willow Tree Art Group, a collaborative project between the Southmead and Henbury Family Practice and Henbury School. Community artist, Barbara Disney, who has experience helping patients at other GP surgeries, will be working with people whose medical problems may benefit from creativity. Research has shown that people with depression, anxiety and chronic ill health can benefit from participating in art- even people who haven’t picked up a paintbrush since primary school. Please contact the practice if you are a patient and are interested. Henbury School also run a successful Community Art Group on Mondays 4-6pm, at which all members of the local community are welcome. Contact John Bennett 9030147. This is the trout caught by a patient, Mr Harvey Johnstone at Chew Valley Lake. And here is the recipe, with home-grown allotment vegetables, which made it into a delicious supper. A large trout - your own catch, or someone else’s- cleaned and gutted. Large bunch of rainbow chard, or spinach, or kale, washed and well-chopped. Heat oil and half the butter in a heavy-bottomed pan with a lid, gently fry the onion until clear, then turn up heat slightly and add garlic and brown slightly. Stir in vegetables, turn off heat, stir in lemon zest, half the lemon juice, black pepper and a good splash of soy sauce. 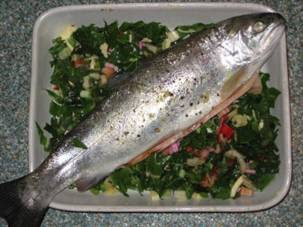 Tip contents of pan into a baking dish, then lay the trout on top. Dot the trout with rest of butter. Cover dish with foil. Bake in pre-heated oven at 180C, gas mark 4, 350F, for 20-30 mins according to size of fish. Garnish with any chopped, fresh herbs. Serve with rice - wholegrain is nutty and nutritious. Transition Henbury/Brentry is a locally based group, looking towards the future when the oil runs out. 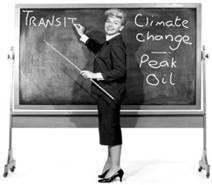 We are, like many other communities, thinking about ways we can make the transition to a less oil dependent way of life. We meet in the Library every other month on the last Saturday. Do come and join us. 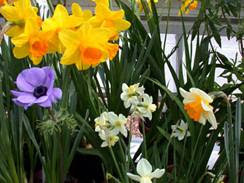 The annual HENBURY FLOWER SHOW will be held on Saturday, 25th July, in the Village Hall. This is a little later than usual but we are hoping for better gardening conditions this year and lots of entries of flowers, fruit and vegetables, art and crafts, cookery and photography - and a lot more. For those wishing to enter, Schedules will be available from early May and posters will go up soon afterwards.Everyone is welcome to come along and see the display. Teas will be served. Twelve adventurous folk are off to Dubai just after Easter. A report and details of the next trip will appear in our next newsletter. As I write these notes we are entering the second week of what the Christian church knows as Lent. Down through the years this is often seen as a period of reflection, and it is certainly a good thing to stop and consider the direction our lives are taking. With the near collapse of the banking system in the West many people are coming to realise how shallow life can be when all we have are material hopes and objectives. When we base our whole life on the accumulation of wealth or the gathering of posessions it is surprising how quickly this can lead to greed and a self centered attitude. Why not use this period of Lent to reflect on the spiritual side of life. For me that means faith in Jesus Christ as God's Son and as we reach Easter again all Christians will contemplate His death and celebrate His resurrection. How about considering going to your local church this Easter and being part of the celebrations. If you want to know more do give a call. “Further to the piece by Tim Parkinson on the proposed Aldi store in your last issue, I note that, on the one hand, it was said that "The proposed building would have a significant impact on the green area along Crow Lane. We need to ensure we enhance our green areas as they are a considerable value in our urban surroundings." and on the other hand, the Futures Group were then cited as resolving that "we should support the application but press for significant improvement in local transport in Brentry and Henbury funded by Aldi...." What has this to do with ensuring "we enhance our green areas?" Indeed, the intention to build on them is in direct opposition to such enhancement! Further, whilst improvements in local transport would be welcomed, the advent of Aldi on this site would add to the already shambolic situation of traffic opposite the school (or anywhere else in Crow Lane) which is already destructive as many people park on the grass verges and create traffic difficulties. Similarly, ad hoc parking on yellow lines and, indeed, double parking is a regular feature of the Crow Lane area. Yet further influxes of traffic will only exacerbate the situation. 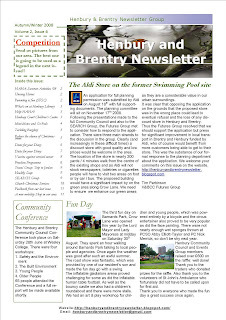 I am not averse to an Aldi store as such - but to locate it on a green site that, according to Tim Parkinson would "have a significant impact on the area" is nothing more than yet another act of corporate vandalism akin to the already problematical skateboard facility that is a scar on the otherwise lovely countryside. It was certainly my understanding, and I hope that Tim will agree, that there is a compromise to be made by ensuring our green spaces are preserved as far as possible whilst fostering the proposed supermarket, and the transport challenges it will present. Certainly, the addition of an ALDI store in our area will be a big change, but hopefully a positive and forward-thinking one. As ALDI are keen to open a store in Henbury, and as you rightly point out, we already have some transport problems along Crow Lane and other areas, this would seem a good opportunity to seek the funding from ALDI to help address them and those we anticipate in the future. henburyandbrentrynewsletter@gmail.com or by phone to Marianna on 0117 9507032 or 07913037199. Special thanks go to all the volunteers and the organizations that without their help and support this newsletter cannot be prepared, produced and delivered. We would like to take this opportunity to request for volunteers to support the newsletter delivery. Unfortunately due to lack of volunteers in the Station Road area the previous issue never got delivered. We apologize for that, but we do need people to help in this area. Please contact us if you can support. 38 council, unrepaired Woolaway type PRCs in Henbury are to be knocked down and the affected areas redeveloped, with brand new council homes and private homes for sale. In addition to the homes, there are some garage sites which will also be used as part of the PRC Redevelopment Project to provide additional housing. · The Project Team are still going through the selection process to find a developer. · As part of this process, Officers have been involved in detailed discussions with the short-listed developers about all the complex issues related to the PRC Redevelopment Project. · Site investigation surveys have been happening across all 4 estates, including Henbury. The surveys were carried out to assess the information needed to produce detailed designs for the redevelopment, such as the levels and makeup of the land. Once the detailed discussions stage has been completed, short-listed developers will be asked to produce their final tenders for the Council to assess and then make a final decision. 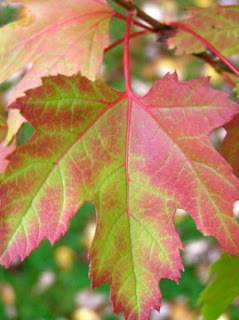 The final tenders will be submitted in Summer 2009. · All newly built properties will be offered to PRC tenants first. The Council are aware that there have been delays to the timescales previously given in the newsletter and also in the PRC Newsletter which is published, but we will ensure that all affected tenants will be contacted ahead of any moves taking place. If you are a PRC tenant in Henbury, and would like to speak with someone about this please call 352 5253, or 352 5284. Kaj Parmar, Project Officer on 352 5284. This annual community event was held on Monday 15th December in Crow Lane. Christmas music was played from mid afternoon by a Roadshow ensconced under a gazebo lavishly decorated with lights, tinsel and baubles etc (all thanks to John Lewis). An amazing snowman handed out Glo Sticks to the children while Henbury Primary schools choir sang carols accompanied by the Henbury School band. At 4.30pm Santa arrived with his elves, to sit in his ‘grotto’ surrounde d by fairy lights, and hand out presents to all the youngsters amid a very realistic snowstorm. The atmosphere was wonderful as everyone entered into the spirit of the festive season. Thank you to all who helped to make the event such a success, especially the Co-op in Crow Lane who generously allowed us to use their electricity and facilities and donated chocolate for the children. 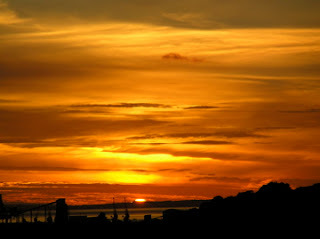 In the last issue we announced a photograph competition from our area. We received some beautiful pictures from Kelly Bullock from Brentry. We also had one black and white from Chas which we believe it deserves to be as a legend in this issue as we promised. Well done both of you and thank you! Check out future issues for more competitions!!! The Castle was built in 1766 on a site with evidence of human habitation dating back 5000 years to the age of Neolithic Man. It is the centre piece of the Estate and commands considerable views of the surrounding countryside. It was built by Thomas Farr the owner of the estate, who was a prosperous Bristol merchant, who had considerable sugar investments in the Americas. One theory for the choice of the position was that it enabled Farr to see his ships entering the river Avon on their way to Bristol laden with cargo from his American Estates. This can be seen on a painting in the Blaise Castle House Museum which shows a pilot vessel alongside a sailing ship awaiting navigation through the difficult tidal waters of the River Avon into Bristol. The Castle is clearly shown in the background. Due to the effects of the American War of independence., Thomas Farr was declared bankrupted in 1778 and was forced to sell the Estate. It was eventually bought by John Scadrett Harford in 1789. The possible original use for the Castle no longer existed and it became a summer house for the new owners and their guests. Certainly the interior of the first floor with wooden panelled walls and impressive period furniture, as shown in the only photographs available, indicate its use of entertaining and pleasure. It would appear that this was the sole use of the Castle for about 150 years until the First World War. 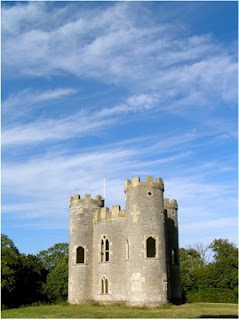 By this time, house parties and entertaining on a grand scale were in decline, and little use was made of the Castle. The only definite information on its use after the War is its occupation by an Estate worker, Mr Castell and his family, who lived in the ground floor rooms for about four years in the 1920’s. A harsh and difficult environment with no modern household facilities. A description of what his life was like can be read from a display in the Castle. Following the purchase of the Estate by Bristol Corporation the building had no real use and was therefore allowed to deteriorate and suffered from vandalism, culminating in a serious fire in the early 1960’s.After considerable interest and pressure from local people a restoration programme between City Council and the Friends of Blaise resulted in saving the building from destruction and the installation of a spiral staircase. 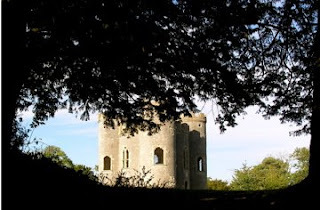 The views for which it was originally built again became available and can be enjoyed by the public on some afternoons in the summer when Friends of Blaise open it to the public. 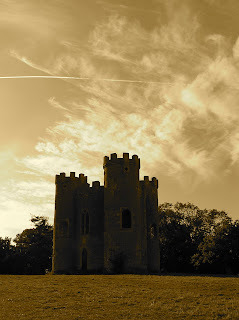 Written by Friends of Blaise Castle.